Born in Baltimore in 1893, Sam Shoemaker was a highly influential priest of the Episcopal Church and is remembered for his empowerment of the ministry of the laity. While attending Princeton University, Shoemaker came under the influence of several major evangelical thinkers, among them Robert Speer and John Mott. After college he spent several years in China and came under the influence of Frank Buchman, founder of The Oxford Group, a group initially oriented toward the personal evangelization of the wealthy and influential. Although he would eventually break from Buchman, aspects of the Oxford Group’s approach would influence Shoemaker for the rest of his life. Training for the priesthood at The General Seminary, Shoemaker became an Episcopal priest in 1921. 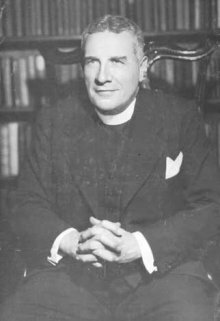 After a brief curacy and further involvement with student ministry at Princeton, Shoemaker was called in 1925 to become the Rector of Calvary Church, New York City, a post he held for sixteen years. During his tenure, Calvary’s ministry grew exponentially, largely through Shoemaker’s ability to hold in creative tension the power of personal evangelism and giving authentic witness to one’s faith while remaining faithful to the liturgical and sacramental traditions of the church. Two significant movements—Faith at Work and Alcoholics Anonymous—have their roots in Shoemaker’s work at Calvary Church, New York City. Faith at Work, founded in 1926, grew out of Shoemaker’s passion for personal witness in the workplace. In the 1940’s, the movement became increasingly ecumenical and many of the leaders of spiritual renewal in mainstream American evangelicalism have connections to Shoemaker’s Faith at Work movement. Also during Shoemaker’s tenure at Calvary, New York, Alcoholics Anonymous was founded. Although Shoemaker did not create A.A., his work provided the foundation, based upon principles he learned earlier from the Oxford Group, for the need to be recognized and the movement to flourish. Much of the teaching upon which A.A. is built bears the unmistakable influence of Shoemaker who is generally regarded as the spiritual mentor of the movement. Later in life, Shoemaker served as Rector of Calvary Church, Pittsburgh. He died in 1963.
i Holy God, we offer thanks for the vision of Samuel Shoemaker, priest and co-founder of Alcoholics Anonymous; and we pray that we may follow his example to help others find salvation through knowledge and love of Jesus Christ our Savior; who with thee and the Holy Spirit liveth and reigneth, one God, for ever and ever. Amen. ii Holy God, we thank you for the vision of Samuel Shoemaker, priest and co-founder of Alcoholics Anonymous; and we pray that we may follow his example to help others find salvation through knowledge and love of Jesus Christ our Savior; who with you and the Holy Spirit lives and reigns, one God, for ever and ever. Amen. Collect. Another weak collect. We are on a roll. Who is writing these late January collects anyway? Hebrew reading: This is probably apropos – but it seems slightly odd. Bio. What a gift to have a ‘who he is’ and ‘why he is important’ statement; and, a ‘He died in 1963.’statement. Thank you ‘o’ anonymous bio writer. Oh, and he has not been dead 50 years. Why has an exception been made for him and not for others listed in the printed edition on page 708? Why have a rule at all? This is not the first time, nor I suspect the last, that an exception has been made. I’m just sayin’. I’d never heard of him before, and am happy to learn about him. He seems to have led a productive life, and his connections with workplace ministry and AA are commendable, but in comparison with others we honor, his work does not seem to be so exceptional to merit inclusion here. What am I missing? I’m wondering why there was no mention of Shoemaker’s prayer, “O Lord, reform thy church, beginning with me.” That brief prayer has been part of my life since I first heard or read it. Hi, Cynthia. I knew “Sam,” as did many people upon whom his influence has been lifelong. I would say he was indeed “so exceptional as to merit inclusion here.” Ever since I knew there was a calendar of saints Episcopalians used, I’ve wanted Dr. Shoemaker to be on it. “Empowering the lay ministry” sums up what he did not only through the groups mentioned above, but through groups like the Pittsburgh Experiment. He would meet with civic and business leaders in Pittsburgh regularly to pray for the city. His life and influence was also one of the reasons many people went into the priesthood, and why for many people Christianity became central to their lives. I met him when I was 19, newly arrived with my family in Pittsburgh from Florida. I had just transferred to Cornell. We lived within walking distance of Calvary Church. My mother said “this doesn’t seem like an Episcopal Church. The ushers are smiling.” The energy and devotion of the man radiated out into the congregation and into the whole city. His sermons reached many people on the radio. Calvary sent his sermons to college students like me. I was majoring in French literature, which doesn’t sound like a very “religious” thing to do, but those sermons made me feel–and the other students who got them –as though our lives were important, whatever we chose to do. I was just one of thousands of people he influenced. Many of them still talk about him today. He used the word “witness” over and over. He talked about the power of the Holy Spirit. He urged people to make Christ the center of their lives. He had a sense both of the worth of the individual and the importance of the community. good job, Celinda. You’re right on about “Sam”. From a former Pittsburgher. Thanks, Celinda. I wish the writer of his bio had injected your warmth and enthusiam, as well as his outreach to the city of Pittsburgh, and to college students. Haviing recently learned that my bishop, +Shannon Johnston [Virginia] is a huge fan, I’m ob;iged to say Go Packers! Well, I guess someone has to say “Go Packers!” Just a little more about “Dr. Sam”: when I wrote to ask how he had been chosen for the calendar, and to thank the committee, Bishop Rowthorn referred me to the article in _The Episcopalians_ (Hein and Shattuck, pp. 295-297) which has a lot of specifics and dates. I thought it was very good. There’s also a mention in the Education for Ministry materials a friend showed me back in 1989 (we were celebrating a “homecoming” for the Anglican Fellowship of Prayer, which his wife, Helen, started in Pittsburgh–it was named in 1958). My friend was in charge of housing for the event and wanted more information about this group! This is how it “fit” in EFM’s accounting: “The small group movement, which began in the 1950s under the leadership of Samuel Shoemaker (1893-1963), Bruce Larson, and the Faith at Work group, is a modern adaptation of the spiritual direction of post-Reformation pietism….” and it goes on for several paragraphs, mentioning Philip Spener and others in the 17th century who thought that “regular attendance at Sunday worship with its preaching and sacraments were not sufficient to shape the spiritual life. There had to be further opportunity for deeper prayer and Bible study in which the truths of scripture could be brought to bear on the minds and hearts of the believers.” It also discusses “the reappearance of these groups in modern-day churches and homes (which was ) part of the revival of popular interest in religion after WW II…” BUT the article finishes with the phrase “other forms of spirituality have appeared today that raise harder theological questions.” That seems to be where we are now, and the challenge for the Anglican Fellowship of Prayer, which I’m a part of, is how to continue what Sam and Helen Shoemaker started with a way to include those “harder theological questions.” I know some of those questions go back to issues contemporary Greeks raised in the time of St. Paul. But they are still being asked, as well as many others that perhaps the Greeks did not think of. The saints can help show us the way, but we have to continue where we are. As a recovering alcoholic for the last few years, but a practicing Episcopal for many more (active in my church, and former employee of Church Publishing), I love having the Rev. Shoemaker added … but … I believe that many in the Fellowship would have a breakdown seeing him listed as “co-founder of AA.” Feel free to contact me before y’all get in a heap of hot water over this one. My sincerest apolgies for posting this comment here, but I can’t seem to find the appropriate place to ask this off-topic question. I see that there are no entries for March 28. The Feast Day of St. Tutilo (Tuathal) of St-Gallen, my patron saint, is celebrated in the RC Church and some Independent Celtic churches on March 28. I would like to submit a write-up for ECUSA to consider his possible inclusion in the final version of Holy Women, Holy Men. He was an artist and musician , 850-915 AD, credited with writing some of the first antiphonal chants and initiating choral responses within the Gregorian liturgies. How would I go about proposing this? Thank you for the clarification, Celinda, and apologize for not being clearer. In fact, I loved the bio but only took exception to the Collect. I’m delighted to see Shoemaker commemorated. The write-up seemed good as I read it. AA is based on anonymity and sees alcoholism as a disease; on that basis I wonder if he’d prefer keeping his AA contributions less explicit, and if the excessive use of the metaphor of drinking to extreme in the Isaiah selection isn’t ill-advised. The collect’s petition (the whole thing is a petition) prays “we pray that we may follow his example to help others find salvation through knowledge and love of Jesus Christ” — lacks any trace of needing salvation (or mutual help) ourselves. We will altruistically help others — probably because “WE” are all so well off, and above that icky human condition stuff. And, we’ll do it through our knowledge and love — being so well informed, and because we have that “loving” stuff down cold. I’m not one to see Psalm 23 as best for every situation, but this seems like a good one — much better than Psalm 130 with its premise that a big emphasis on iniquity is what’s called for here. The NT lessons seem good. I want to say that Celinda’s information about Shoemaker’s role in the city context is magnificent, and I’d love to see it included in the bio. Another afterthought — if the AA information is done in a way more mindful of the fact that anonymity is a serious matter, not just a catchy mouthful, when it comes to AA, it might still be appropriate to acknowledge what he was doing by saying it in terms of his being an early pioneer in the area of the church’s spiritual and behavioral outreach in areas of substance abuse, alcoholism, systems for addiction recovery and (if it applies — I’m less than certain, but I believe it applies) in taking seriously alcoholic addiction as a disease with a spiritual dimension. Thomas Simmons–I asked the same question about Dr. Shoemaker back in 1999, and was told I should follow the procedure outlined in an appendix in_Lesser Feasts and Fasts_, 1997. As it turned out, I began following the instructions but did not persevere. It was a very happy surprise when I learned that others had taken the necessary steps. (And Michael, it will indeed be 50 years since his death in 2013, which I think is only a year later than when GC does the final approval. The thing about the 50 years, and getting started soon enough, is that there will still be people living who remember the proposed saint.) Anyway, Tuathal Thomas Fitzsimmons: there’s a complete outline of the most recent procedure starting on page 741 of _Holy Women, Holy Men_. 7. Perspective: It should normatively be the case that a person be included in the Calendar only after two generations or fifty years have elapsed since that person’s death. Right. And to repeat: in 2013, those 50 years will have elapsed. Sam Shoemaker was called “co-founder” of AA by its founder, William Griffith (“Bill”) Wilson (incidentally, an Episcopalian). He is not yet listed in the Appendix. I suggest that at least his name be added to the Appendix on page 708. He died on Jan. 24, 1971. Ideally, a joint commemoration for the two of them would seem appropriate. The SCLM has three options: go ahead with Sam S. alone now; breach the 50-year guideline; withdraw Sam Shoemaker until GC 2021. My guess is that, now Sam S. has been initially approved by the 2009 GC, naming them both in 2012 would be the least undesirable alternative. A more fitting subtitle would be “Co-founder of Alcoholics Anonymous”. If my suggestion of naming “Bill W.” also is followed, that first word should be n the plural. He belongs in the calendar for that, albeit he was a priest and an evangelist. Line 1, first paragraph: I would like to see the day, month, and year of Sam’s birth added, but I don’t find it online. Line 1, third paragraph: I suggest deleting “The”. That formal name isn’t used in common parlance. Line 2, sixth paragraph: add date (presumably January 31) and place of death (at Pittsburgh?) after “died”. Sam Shoemaker’s ministry with AA was important, but he did much more than that: Faith at Work, the Pittsburgh Experiment, books on the Holy Spirit, etc. He was unusual for his time in the Episcopal Church not only for the work with AA, but for his strong evangelical emphasis. I would not like to see “co-founder of Alcoholics Anomymous” be the subtitle partly because it would imply his other ministries were not important, and partly because there is some disagreement on whether he was an actual “co-founder.” See the book I cited above for more information about that. I have sent the commemoration around to others in the Fellowship, and I haven’t found one who agrees with the statement “co-founder” … can someone cite a reference for that assertion other than Nigel’s? Celinda is right to point out that Shoemaker deserves to be remembered (whether or not commemorated) for much more than his role in AA. He was an apologist as well as an evangelist, and wrote over thirty books commending the Christian faith to the world at large, many of which were widely read. He was also deeply concerned about the Episcopal Church, believing that too many of its members did not show the fruits of faith in their lives, as the titles of some of his books show—Revive Thy Church, The Church Alive, The Church Can Save the World, The Conversion of the Church, Twice-Born Ministers and others. After twenty-five years in parish ministry, I have to say I think his diagnosis is still justified, and the kind of work he was doing still needed. If those involved in the Evangelical Revival we saw in the Episcopal Church during the 1970s and 80s had followed Sam’s model, especially in terms of building up lay rather than clerical ministry, our recent history might have been very different. The collect is disappointing, not only because of its reference to AA and its clericalism, but because of its general listlessness. We’ve had several collects than begin with what seems to me a rather perfunctory vocative, ‘Holy God’ in this case, and while I regularly use such phrases in un-premeditated prayers, they seem to fall rather flat in a liturgical setting, and I’d urge a return to the more traditional options—‘Almighty and everlasting God’ and so on. Starting out on a note of majesty will lift the whole collect. I’d be more specific about the ‘vision thing’ than about any particular effort by which he tried to carry it out: perhaps ‘we thank you for giving Your servant Sam Shoemaker the vision of a renewed church sharing the gospel at all levels of human society’ or something along those lines. Thank you for including my father Samuel Shoemaker on the list. There is one mistake in the bio; he served Calvery Church in NYC from 1926 to 1952, 26 years not 16. My first reply was a correction in the bio but here are some thougts about my father. Samuel Shoemaker with his eloquent preaching, his winsome personality, and sublime sence of humor propelled many dozens of young men of all denominations into the ministry in the 1940s and 1950s. Many millions of the 12 step participants are still beholden to Sam for a significant part of their recovery. His spiritual presence was radiiant and with his over thirty books is carried forward today by countless Christians around the world. Billy Cgraham called him one of the most influential Christians of the 2oth century. And so he was. i am trying to locate the final resting place of Rev Shoemaker. Can anyone out there assist? Thank you. Tne Rev. Sam Shoemaker is buried in the famliy lot at St. Thomas Episcopal Church in Garrison Forest, Maryland, on the outskirts of Baltimore. I suspect that the people at Calvary Pittsburgh would know where he is buried. It is really bothersome to list that Fr. Sam was a “Co-Founder” of AA. I say that recognizing that Bill Wilson gave him that honorific. Most people in the program would tell you that Bill W and Dr. Bob were the co-founders The term “Spiritual mentor” seems much more appropriate. I can assure you that Sam+ has had a great influence in the 32 years of my recovery and… my vocation as deacon and priest. During his tenure at Calvary Pittsburgh, Sam+ founded an ecumenical and evangelical movement called The Pittsburgh Experient which I believe continues to this day. His time in Pittsburgh was very productive but treated in the biography above as an after thought. His time in Pittsburgh certainly adds to the rationale to comemorate Sam+ and his ministries. Fr. Shoemaker’s work also includes his sermon “What the Church can learn from AA”. Google it. I think you will find four helpful suggestions as fresh today as they were nearly 60 years ago. Thanks, Lamar. The Rev. Dr. Philip Wainwright quoted you today on the Barnabas Project. Just one correction: the original title of the poem is “I Stand by the Door.” Helen Shoemaker used it as the title of the biography she wrote of her husband, and when Calvary Episcopal Church in Pittsburgh first celebrated their former rector’s feast day January 31, 2010, an addictions counselor movingly read the poem aloud at one point during the service. About Sam’s role in the founding of AA: I don’t have my sources with me right now, but do remember that “spiritual mentor” is a step in the right direction for describing it. It was Sam, I am fairly sure, who said “just take one step at a time” –and that led to the idea of the 12 Steps. As a child we went to my grandmother’s house to periodically listen to Sam’s radio broadcasts on Sunday and then discuss the merits. Sam and my grandmother were first cousins, and she greatly treasured her friendship with him through regular letters and telephone calls. I could tell they were on spiritual and personal journeys; confiding, comparing notes, supporting one another. We learned early that his writings became the basis for the twelve steps in AA but that we were not to mention this at his request for two reasons. Most importantly, Sam placed his work and teachings at the service of others, that he truly stood by the door and the real work in AA was done by others. The second reason was a story of human nature. Being the director of the Oxford Group also placed him with many responsibilities in the company of the well meaning and well heeled. There were some who found Sam’s link with alcoholics a bit troubling while still acknowledging it’s worthiness, of course. Working in multiple arenas, not all compatible, had it’s pressures, so discretion was advised. As a kid I met him a few times when he visited California. He was family, he was busy, on tight schedules, but always gave quality attention. I could tell he was a sweet, caring, and lovely man, even though my grandmother said this all the time. She cherished their friendship. Thank you for honoring Fr. Sam Shoemaker. He in my mind is a saint amongst the Churchmen and Women. I think Dr. Bob would have agreed with Bill W. Sam was very involved in not just recovering the Church, but recovering souls for Christ albeit the drunken sots that many leave behind. I’m very late to the party here, but the concern about Sam Shoemaker’s anonymity is misplaced. Anonymity, as a spiritual principle of Alcoholics Anonymous, refers to members of the fellowship preserving “personal anonymity at the level of press, radio and film.” It does not apply to Sam Shoemaker anymore than to Henrietta Sieferling (another early friend of hue he fellowship and the person who introduce Bill Wilson to Bob Smith). Neither were (at least so far as is recorded) recovering alcoholics themselves and therefore were not members of the fellowship, how ever close or pivotal their friendship. I too was struck by the reference to Shoemaker as a “co-founder” of Alcoholics Anonymous. However, if Bill Wilson was prepared to call him that, who am I to question? Hi Malcolm, Thanks for your comment. Next time please include your last name. –Ed.